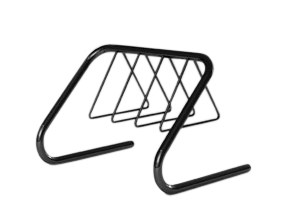 The Triton™ bicycle racks are truly unique compared to other racks with their artful design and clean flowing lines. Welded triangle locking bars and a sleek frame design hint at a new dimension to bicycle parking. Mounting bikes on this rack is a no-brainer with the option to mount to either side of the triangle. A combination of style and high security, the Triton™ enables each bicycle to be secured by frame and wheel with a single U-lock. 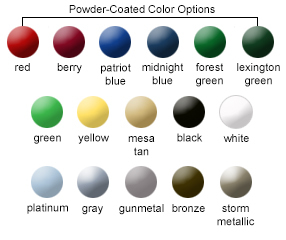 Bicycle racks can be finished in any of the powder-coated color options shown below or for a more economical option they can be galvanized for a muted gray appearance. Freestanding, in-ground, and surface mount frames are available.